Adding plants to your home is a smart and inexpensive way to spruce up your space without breaking the bank. By choosing ornamental plants, you can transform a room from ordinary to extraordinary by adding color, texture and natural beauty. You'll be surprised how much they dress up your digs. Below, our top 10 favorite picks. Big, beautiful, showy leaves are the hallmark of a pothos (Epipremnum aureum), an easy-care houseplant with show-stopping foliage. It cascades like a splashing waterfall from hanging baskets or grows upright if offered support. Give your pothos moderate water plus a spot with some sun or bright light. If you thought that bulb plants are best planted outside, the amaryllis, also known as Hippeastrum hybrida,will prove you wrong. Sometimes called the most magnificent of all bulbs, amaryllis are famed for their enormous, vivid flowers on slender stalks. What color? Choose between red, salmon, orange, pink, and multicolored. Sold as potted flowering plants, the amaryllis produces its flowers at the end of the year and continues until the beginning of summer. At that point, dig out the bulb, store it in a cool, dry place for six weeks, then replant and watch the show begin again. For something different and magical, try ornamental grass as a houseplant. One to consider: 'Silver Mist' mondo grass (Ophiopogon), with delicate foliage in shades of elfin green and silver. Grown in a container, Silver Mist grass shoots up to 10 inches tall. Keep the plant in bright, indirect sunlight and water occasionally, only when the soil gets dry. With brilliant red, waxy bracts plus spikes of spathe, flamingo flowers stand out in a crowd. They make exceptional houseplants. Also known by their scientific name Anthurium, flowering flamingos bear tiny flowers on the spathe that later develop into bright red berries. It's quite easy to keep the plants looking great. Just water occasionally and wipe dust off the lance-shaped bracts with a moist sponge. It's hard to find a person who kind of likes African violets (Saintpaulia). Most people who own one are passionate about the compact, free-flowering plant with velvety leaves and bright flowers. If you love it too, pick a color (white, purple, pink, lavender, or wine), install it in a area that gets filtered light, and watch it bloom year round with only a little care. Water carefully at the plant base, with lukewarm water you've allowed to sit for 48 hours. Bromeliads are beautiful foliage plants that are found in a variety of genera including Aechmea, Neoregelia, and Guzmania. Their leaves are strappy, and come in reds, greens, purples, oranges, and yellows, and you can even find some banded, striped or spotted. They grow in rosettes forming a type of central urn or water-collecting cup. Bromeliad blossoms, tall, bright spikes of bracts, grow from the center of this cup. In the wild, bromeliads get foods and nutrients via rain that fills up the cup, but in the house you are better off using fast-draining potting soil. The large, leathery leaves of a tall fiddle leaf fig (Ficus lyrata) can automatically make a room feel different and refreshed. The bright green, dinner-plate-sized leaves are "carved" into the shape of fiddles. Give your little tree moderate light and keep its soil constantly moist but never wet. Lush, purple, lance-shaped leaves make purple heart plants (Tradescantia pallida) an exceptionally ornamental houseplant. Plant this exotic beauty in a hanging basket to let the foliage droop gracefully over the container. Then, come summer, you'll see tiny pink three-petaled blossoms growing in the leaf axils. They offer a stunning contrast to the deep foliage that captures every eye. Only water when the soil is dry. No, flowering maples (Abutilon hybridum) are not even vaguely related to maple trees. But they are spectacular houseplants with deeply lobed leaves (that look a bit like maple leaves) and delicate, drooping blossoms in a variety of vivid colors. Give this small shrub an east-west window and water when the top inch of soil is dry. With good care, the flowering maple can flower most of the year. Elephant bush (Portlucaria afra 'variegata' ) may sound too big for the house, however, the plant is actually ground cover outdoors and a perfect foliage plant for hanging baskets. 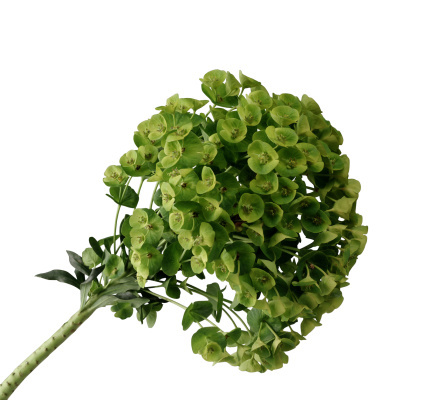 This lovely plant has thick, red branches covered with small, round, attractive leaves. Sometimes you'll also get tiny white or pink flowers. 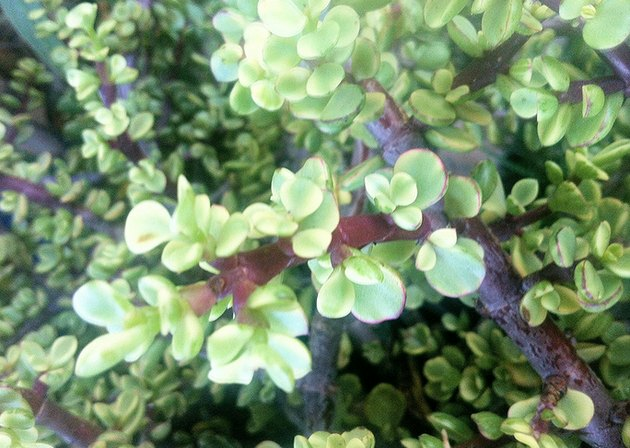 Give elephant bush bright sunlight, well-drained soil, and regular water.